Let me tell you the story of a small town nestled in the valley next to the Delaware River and Pennsylvania called Lopatcong (part of Phillipsburg, NJ). I moved here in 3rd grade and still live here. My husband grew up here, too. I went through a period of time (college to a couple years ago) where all I wanted to do was move elsewhere. But it's home (for now at least) and there are lots of things I love about it. Country views, less traffic than pretty much anywhere else in NJ (thank you, Warren County), a good school system, amazing local tacos and pizza, and closeness to Pennsylvania (so much to do and see there), family, and old friends. 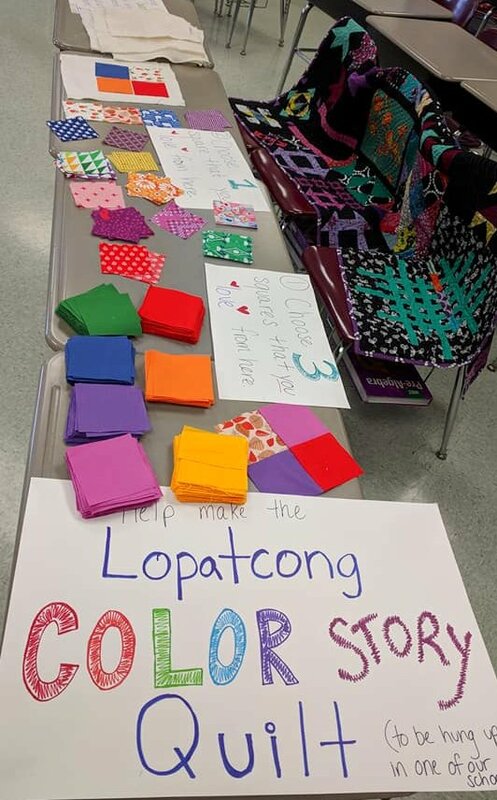 For several years, I've had the honor of organizing and jump-starting community quilt projects here, thanks to the Lopatcong PTA and Warren County Cultural and Heritage Commission. I set up camp for one day at the annual Day of the Arts celebration in March, armed with fabric, a sewing machine, and a plan. This year, I wanted to create a quilt project that relied on the color preferences of all who walked in (kids preschool age to middle school, plus parents and teachers). Think bright, bold, beautiful rainbows. I hoped that the quilt would contain many signatures and serve as a special piece in time for the town. Now that it's done and being exhibited around town, I'm thrilled to share it online as well! 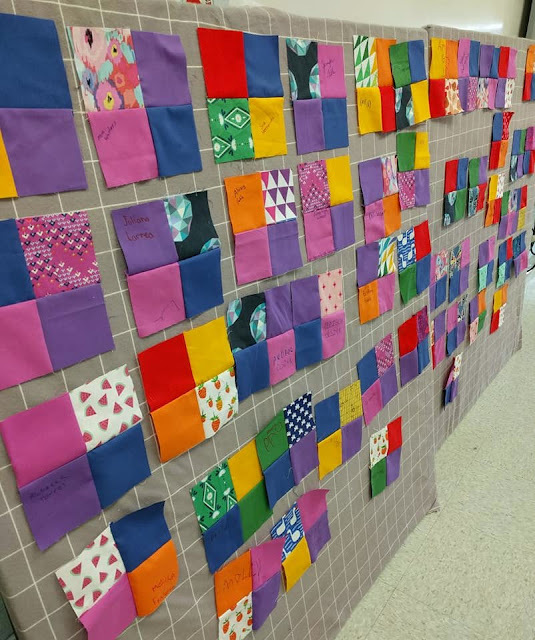 Community quilts are extremely special, time-consuming projects. They take a lot of planning and effort, but the ultimate final product is worth it all. 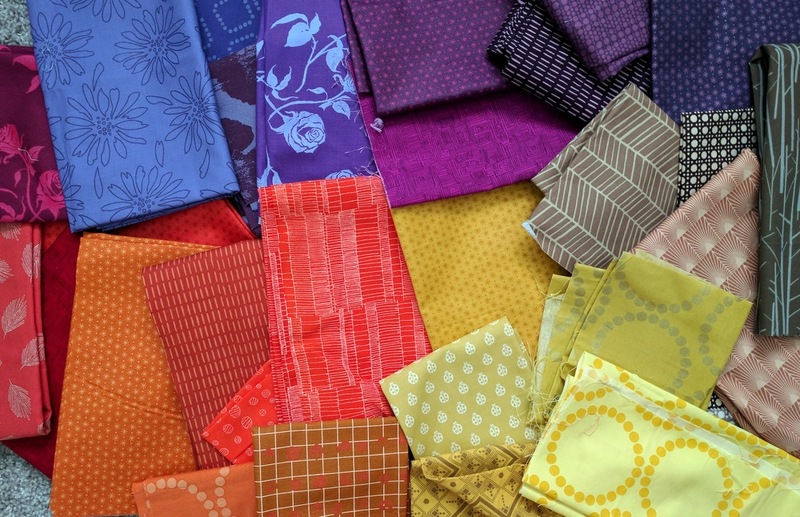 First, I bought a rainbow of fabric in person at Pennington Quilt Works (my LQS - had to get juuuuuust the right tones!) and cut a million or so squares by hand (which was actually pretty therapeutic - I usually have no need for something like a die-cutter, so I don't have one anymore). On the day of, we were open for business for about five hours. Anytime someone entered the room, they were instructed to pick 3 solid squares and 1 print, and arrange them in a four patch on a piece of batting. Then, they carried their creation over to one of the sewing machines. My teenage sewing student and I teamed up for the day to sew the blocks (90 total!!). I definitely could NOT have made this quilt without her. Sometimes the room was packed with people waiting to get their squares sewn, and it went twice as fast with her! As we sewed the seams, we showed each person how our sewing machines work. Kids are always so interested in watching the pedal and needle move. I had several really interesting and exciting conversations with parents about sewing and teaching their kids! Yes, I surrounded my name with orange peels on purpose. What did you expect? :) That's the fun of being the quilter! After we finger pressed, participants signed their name with fabric markers and placed them on one of the design walls. After the event, I sewed all the squares together randomly (making sure names were right side up as much as possible). It's fun to see where patterns emerge (like down the left side - pink and blue kept repeating). This quilt was asking for randomized quilting around the names. I used Aurifil 2605 (gray) so that the quilting would blend with the rainbow of color. 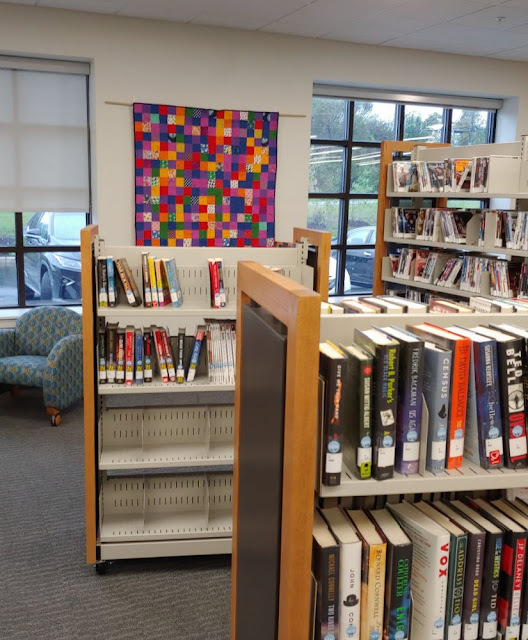 Now, the quilt is currently hanging at the newest branch of the Warren County Public Library (in Stewartsville, right around the corner from Lopatcong). It's supposed to travel to a few other locations afterwards. What a thrill to see the quilt out there! If you're local, make sure to visit it soon before it moves! I'm already planning a tentative 2019 project with the hope of making for local veterans. This quilt was made possible thanks to the generosity of the Lopatcong PTA and Warren County Cultural and Heritage Commission. Thank you! Change is in the air with fall in the USA and the quilting world (did you see Amy Butler is leaving the quilt industry, for example?). But change is good. If you read The Wonky Press, my bimonthly email newsletter for the past 3 years and 73 issues, you might have seen that the last issue just went out on 10/2. Writing and editing the newsletter was a huge, important, thrilling part of my life, but with a drastic change in my free time (new job and about 10 hours commuting each week), I feel unable to keep up the quality of such a publication right now. The good part about this is that I'll be taking better care of myself with less time on the computer writing and seeking out links (often, links to cool quilty stuff just pop up, but I'm finding myself much less on Facebook and Instagram in general, so there's a need to hunt around). The other good part for you (if you're reading this) is that I still plan to blog and post on Instagram. Blogging will probably be 1 or 2 times a week, maximum, and I'm not holding myself to a schedule. But I promise to keep documenting my quilty journey here and interacting/participating in the online quilting community. If you'd like to read more about why I closed the newsletter, click here to read the last issue (yes, even though my newsletter account is deleted, you can still access issues! Here's a link to many of the recent ones). I'm genuinely thrilled to have gotten to know so many of you through the newsletter. I realize this announcement might come as a surprise to many of you. I think I've responded to all emails and comments about this so far - thank you so much for all your understanding and support! Additionally, I'm taking a break from lecturing and teaching quilting in 2019 and until further notice. I need some time to recalibrate from so much traveling and planning. This year was meant to be a bit less busy than 2017, and it turned out to be more so! Thank you SO much to all the guilds who have emailed me and would like to book me. I will certainly let you know in the future if/when I am booking engagements again. I have updated my Classes and Lectures page to reflect this change. Pumpkin Pie quilt, made for my mom last year, which is bringing up a lot of memories right now (click the link to read the quilt story). Stay tuned for some real blog posts! I'll be participating in two huge projects this fall (one in Massachusetts and one here in NJ), plus I'll have information on an exciting quilt exhibit my friends and I got juried into. 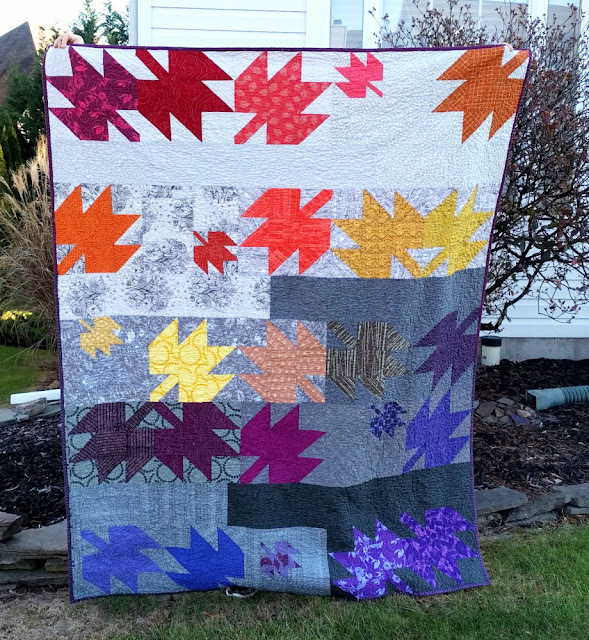 Plus - 4 quilts to share, and 2 are for the Quilting Modern Quilts blog series!